January, February and March. Commodity financed under A.I.D. Loan 263-K-052. Committee, 24 Goumhoria Street, Cairo, Egypt. Mohammed Iqbal, Chandjees, 153 Bank Road, P.O. No. 384, Rawalpindi Cantt, Pakistan. Phone: 65475. Telex: 5758 ABL PK CHANDJEE. Cable: CHANDJEE. Leboh Pantai, Penang, Malaysia. Cable: UBIBAWANG. Phone: (04) 369-540. PRODUCTO TAIPEI. Phone: (02) 7518191-4. 2, Germany. Telex: 522966. Phone: 089Vyg 385. 02-12221 (HAWE D). Cable: HAWANEK HAMBURG. Phone: 040-36 22 57.
interested in suppliers, who have the whole process from milling to final product. Mauerkircherstrasse 10, D-8000 Muenchen 2. Telex: 528056. Cable: HAJNALIMPEX. Ayad, 43, Misr Sudan St., Hadayek El Kobba, Cairo, Egypt. General De Commerce Et D'Industrie, B.P. 2506, Ouagadougou, Upper Volta. Cable: 5292 SITA. Phone: 335-36.
all types, best quality, institutional size plastic bags. Agent wishes to rep.
stick on labels, if required. Quote C&F La Guaira. Bank ref: Banco De Lara. Contact: Rene Antich, Alimentos Murry, P.O. Box 80915, Caracas 108, Venezuela. Fontabelle, St. Michael, Barbados W.I. Cable: JASON JONES. Phone: 63501 Thru 4.
dried fruits, dairy products CIF Dubai or Sharjah. Bank ref: Lloyds Bank Ltd. Contact: Ms. Mary Hardy, Country Foods Ltd., 3 Allison House. St. Andrews Rd. Henley-on-Thames, England. Phone: 04912 77026. Andreas Kruppa, Hohenrade 5, D-2300 Kiel 1, Germany. Phone: 0431-37373. Street, Stratton-St-Margaret, Swindon, Wilts, England. Phone: 0793 825372. Surrey KT# 4RA, England. Telex: 888941. Phone: 01-949 4754. 021, India. 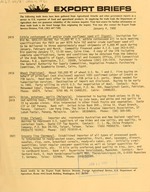 Telex: 11-4904 UTCO IN. Cable: QUICKPORT. Phone: 235240/244687. (especially seasonal/holiday sweets). Bank ref: Stadtsparkasse, 4300 Essen. 4300 Essen, Germany. Phone: 201-286080. Telex: 8579768. Str. 74, D-2800 Bremen 1, Germany. Phone: 0421/250263. Sherif El Halabi, Ranimport Trading Co., 75, Sudan Street, Dokki, Cairo, Egypt. Telex: 92505 ZMLEC UN. Attention Ranimport. Cable: RAN IMPORT, CAIRO. commodities, Ministry of Supply and subject to AID regulations. Quote FOB, C&F. 92232 SHIN UN, 92073 SHINTAM UN. Cable: SHINTAM, CAIRO. Phone: 758412.
and 5,000 tons in used drums. Quote C&F, FOB. Bank ref: National Bank of Egypt. Cairo, P.O. Box 1589, Cairo, Egypt. Telex: 92232 SHIN UN, 92073 SHINTAM UN. Cable: Shintam, Cairo. Phone: 758412. 92073 SHINTAM UN. Cable: SHINTAM, CAIRO. Phone: 758412.
ments, good quality, consumer size cans in cartons and institutional size packages. Mueller Import, Export, Wholesale, Nibelungenstr. 70, D-8000 Muenchen 19, Germany. Telex: 524438. Cable: FREDMAN MUENCHEN. Phone: 089/170791. Manager, Kuwait Food Company, P.O. Box 3901, Dubai, United Arab Emirates. Telex: 68349 KT FOOD EM. registered, should be 3-7 months pregnant. Quote CIF Cairo and CIF Alexandria. SHAAB UN, Attention: KAMEL EL KAFRAWY. Phone: 895483.
moisture and volatile matter at 105C max. 30%, impurities and sediment max. 0.10%. Delivery before Jan. 30 or loaded immediately upon confirmation Letter of Credit. through the agricultural attache, Ankara, Turkey. J26444 MUROMACH. Cable: MUROCHEM TOKYO. Phone: 03-241-7191. Co., Ltd., 1-1, Kamejima 2-Chome, Nakamura-Ku, Nagoya, Japan. Telex: J 59939. Cable: SEIWA TRADE. Phone: 052-451-3181. GENCO UN. Cable: GENCONTRADE. Phone: 753500 or 753631. El Mamary St. 10, Eloui St. Flat 3 Cairo, Egypt. Phone: 758918/741573. catering, butter, fruit juices, soups, tomato paste, and other grocery items. Egypt. Telex: 93742 MK. Phone: 752766/742617. Commercial and Economic Office, 2715 Connecticut Ave., N.W., Washington, D.C.
Commodities, 24 Gomhouria Street, Cairo, Egypt.